ORLANDO – St. Luke's UMC has launched a pioneering Community Transformation Initiative to help break the cycle of poverty for many of its neighbors. 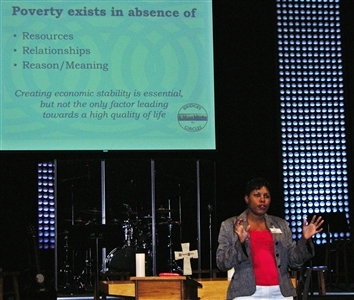 Estelle Lee of Catholic Charities in Pensacola shares information about the Circles Campaign approach to ending poverty during a "Mission Possible" conference April 27 at St. Luke's UMC, Orlando. The 4,600-member congregation, rooted in an upscale suburban part of Orlando, will partner with a nearby low-income neighborhood in a holistic approach that empowers residents and tackles socioeconomic problems with assistance from church members. The ministry has been in the talking stages for about a year, said Lynette Fields, St. Luke's executive director for servant ministry. 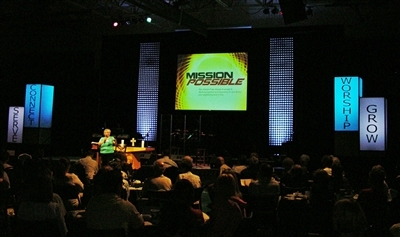 Last week, the church kicked off the effort with a two-day "Mission Possible" conference, inviting about 100 people to hear about economic development models from as far away as Northern Ireland that focus on giving people the tools to help themselves instead of just infusing funds. "This is an absolutely fundamental shift,” Fields said. “A lot of church missions in past generations have been charity-oriented and have been designed for those who have the resources rather than those who need the resources. Instead of taking on a single issue like unemployment and dictating solutions from the outside, St, Luke’s plans a place-based approach that makes residents of the low-income neighborhood part of the solution. Church leaders recently began discussions with influential members of a local low-income community that they hope to partner with. The initiative is at “the cutting edge of ministry,” said Bob Lupton, author of "Toxic Charity" and president of the nonprofit FCS (Focused Community Strategies) Urban Ministries Atlanta, who spoke at the conference. The meeting also included workshops on neighborhood and family stabilization. Founded by Lupton in 1976, the Atlanta effort has developed two mixed-income subdivisions, organized a multiracial congregation, started a number of businesses, created housing for hundreds of families and initiated a wide range of human services in the surrounding area. 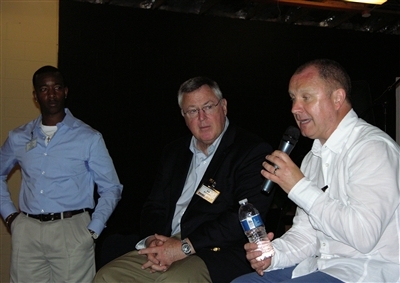 Lupton said entrepreneurs can use their skills to better the lives of others. Rev. Corey Jones, community minister at St. Luke's UMC, left, looks on as Bob Lupton of Atlanta and Rev. Gary Mason of Belfast, Northern Ireland, discuss their respective economic outreach efforts at a "Mission Possible" workshop at St. Luke's. “God has entrusted that gift to you for Kingdom purposes, and you can have a transforming impact on your world," Lupton told conference attendees. In Atlanta, for example, business people helped buy empty lots in a blighted neighborhood, which led to economic improvement there. An outpouring of giving from churches over the years has done little to help impoverished people, Lupton said. “We have led the way in clothing and feeding the poor with millions [of people] sent on short mission trips at a cost of about $4 billion," he said. "The question we now need to ask ourselves is, for all that work, are we moving the poverty needle?" He predicted the St. Luke's initiative will take a decade or more to bear lasting fruit, but he was talking to church members with a history of building community partnerships and tackling seemingly intractable social problems. In 1996, St. Luke's lead pastor, Dr. Bill Barnes, heard God's call to help low-income people in need of care. Six months later, with parishioners' support, the first volunteer-operated Shepherd’s Hope Health Center opened. Today, Shepherd’s Hope operates four clinics staffed by more than 2,000 volunteers and medical professionals who serve more than 20,000 patients a year. "You are not just paving the way in community transformation. You are leading the way denominationally." "One of the things we believe God was leading us to was to do something in the lives of children in poverty, but in order to do this we realized we had to work with a family and then we realized we had to work with a community,” Barnes said. As a blueprint for the ministry, the church adopted a model from the Dayton, Ohio-based Circles Campaign that identifies skill sets and assets, creates goals and builds relationships. Each circle starts with a family that sets the direction for activities. The circle includes middle- and upper-income allies to befriend and support the family, according to the Circles Campaign website. Matching allies and families is key to the process, said Estelle Lee, a Circles coordinator with Catholic Charities of Pensacola who spoke at the Mission Possible conference. Barnes said he also draws on the expertise of a friend, Rev. Gary Mason, a Methodist minister who founded an urban renewal project called Skainos in East Belfast, Northern Ireland. Mason conducted a workshop with Lupton and also led a worship service as part of Mission Possible. Lynette Fields, executive director of servant ministry at St. Luke's UMC, addresses a packed house at the church's Community Transformation Initiative conference on April 27. Mason believes there are lessons for the Orlando congregation in the Skainos project 4,000 miles away. The Belfast effort responds to some of Northern Ireland's worst socioeconomic troubles in a society riven by the lingering effects of a 30-year civil war. Skainos works to address unemployment, homelessness, conflict resolution and family issues. “Sometimes there’s a tendency among my own congregation to sit back and let the paid professionals spearhead this," Mason said. "But [the St. Luke’s initiative] will never happen without you being part of that journey. The Belfast pastor believes the project will have implications far beyond Orlando. The next steps include more discussion with members of the low-income community, allowing them to tell their stories, identifying leaders, forming a joint task force, mapping assets and building relationships. Fields said the church wants to be sensitive and avoid taking a paternalistic approach. “It is an amazing effort,” said Susan Stauffer, a member of St. Luke’s for 20 years who attended the conference.